Comet ISON is officially dead : dixit circular CBET 3731 published on December 1st 2013 by the International Astronomical Union. What happened? 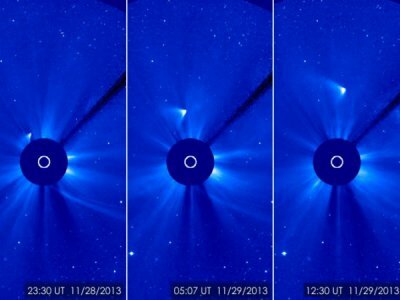 The nucleus of comet ISON fell apart at its closest approach to the Sun. Pictures acquired by space observatories on November 28th and 29th 2013 suggest that all that is left is the tail and a lot of debris. Comet ISON, discovered in Russia on September 21st left astronomers breathless for over a year; they are now hoving to concentrate on the debris. Continuing observations of these fragments will lead to an estimate of their size and importance. See also ISON: the comet of the century?